A traumatic brain injury (TBI), usually caused by a sudden jolt or blow to the head, is a neurological trauma that causes damage to the brain. Because of the rapid back-and-forth movement of the brain inside the skull, there may be swelling, bruising, or internal bleeding. The most common causes of TBIs include falls, sports injuries, vehicle accidents, and assaults. However, TBIs are most closely associated with military personnel in combat—particularly soldiers returning from the Afghanistan and Iraq wars who were caught in blasts from improvised explosive devices (IEDs). While approximately 1.5 million people in the U.S. experience a TBI, more than 260,000 veterans who returned from Iraq and Afghanistan were diagnosed with one. 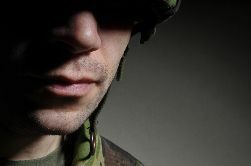 Research and studies show a connection between those who have experienced a TBI and those who suffer from post-traumatic stress disorder (PTSD)—particularly in veterans. Those who experience PTSD can often feel anxiety, negativity, and anger after being exposed to some type of physical threat or terrifying event. In research published by the United States Department of Veterans Affairs (VA), military soldiers who experienced a TBI during deployment may have a higher risk of suffering from PTSD when they return home. Although PTSD is a psychological injury and TBI is a neurological trauma, both types of injuries have symptoms with similar characteristics. And according to the Journal of the American Medical Association Psychiatry, the probability that a service member would suffer from PTSD doubled if he experienced a severe head injury. TBIs and PTSD are often discussed together because the symptoms are similar, and often it’s difficult to differentiate them. Also, many people with PTSD have also had a severe head or brain injury, and there are some theories about this association. One, some researchers believe that a person’s cognitive function can be damaged after a TBI, and this type of brain injury may negatively impact or impede that person’s ability to deal with the results of the psychological trauma. Ultimately, this can lead to a higher frequency of PTSD. Two, military personnel are likely to have suffered a TBI during a very harsh and stressful event that increased the risk of suffering PTSD because the trauma was particularly intense. Research continues to show that TBIs in those who’ve been deployed may be a risk factor for developing PTSD due to the traumatic events of combat. However, there are distinct differences in symptoms, too. For example, veterans with PTSD may have difficulty remembering the traumatic event they’ve experienced, but they are still capable of learning, and their memory is still undamaged. However, veterans with a TBI may be able to remember past events, but they may have trouble with new memories and learning new things. Research also shows a connection between TBIs, PTSD, and the suicide rate among veterans. The incidence of suicide has increased significantly since 2003—the beginning of the Afghanistan and Iraq wars. Efforts have been made to determine why there’s an increase in the suicide rate, and both PTSD and TBIs could be linked to this increase. In 2008, approximately 36 percent of veterans and soldiers were severely injured due to PTSD and/or a TBI; consequently, mental health is a serious concern for those in the military. While not every soldier who experiences a brain or head injury will suffer from PTSD, and not all who experience extreme stress have been exposed to blasts from IEDs, both types of conditions can diminish mental health. If you’re a veteran suffering from a TBI and/or PTSD, you may find it difficult to prove that your conditions are service-related. The VA has a new rating system for TBI claims, and our team at Cuddigan Law can help evaluate your case, so you receive all the compensation you deserve. Call us today at 402-933-5405 to discuss your disability case.